Writer Paddy Chayevsky's prescient 1976 satire of lies, injustice and the American way...has lost none of its sting. 121 min. MGM. Director: Sidney Lumet. Cast: Faye Dunaway, William Holden, Peter Finch, Robert Duvall, Wesley Addy. America is amusing itself to death. The broadcast network bows to corporate interest, serving the almighty dollar before serving the public interest. A recession grips workers with fear, while mass media defines their reality with a cacophony of talking heads. Sounds very much like now, but it's also the world of Network, writer Paddy Chayevsky's prescient 1976 satire of lies, injustice and the American way. Chayevsky won his record-breaking third Best Screenplay Oscar for Network, which bit the hand that fed him and director Sidney Lumet during the Golden Age of television. A dry narration sets the scene: "In his time Howard Beale had been a mandarin of television. The grand old man of news..." but the network news anchor has become a listless screen presence (and a drunk); since television is in the "boredom-killing" business, Beale has outlived his usefulness. Given two weeks notice, Beale goes on a bender, which he brings with him onto the air. In what's either a nervous breakdown or a monet of profound clarity, Beale announces on air that his time is up, and that he'll be shooting himself in the head post-haste. This black eye for the network gets out of control when Beale's best friend Max Schumacher (William Holden)—the Don Hewitt-esque head of the news division—grants Beale's request for a dignified sign-off. Beale takes the opportunity for a profound rant about life's meaninglessness, opening a Pandora's Box for the Union Broadcasting System (UBS). Swiftly rebranded as "a latter-day prophet denouncing the hypocrisies of our times," Beale becomes the highly rated ringmaster of a nightly-news circus that eventually, under the aegis of ambitious exec Diana Christensen (Faye Dunaway), includes "Sybil the Soothsayer," "Jim Webbing and his 'It's-the-Emes-Truth' department", "Miss Mata Hari and her skeletons in the closet" and "Vox Populi" (a fine analogy for today's internet culture of every news article inviting "comments"). Before a stained-glass backdrop, Beale nightly delivers ecstatic, messianic sermons always punctuated with a knockout collapse. Like Cassandra, he's doomed to deliver the truth to an audience of happy cows who only partly understand the message. "This is mass madness, you maniacs," he raves. "In God's name, you people are the real thing. We are the illusion." Chayevsky's assault on the dehumanization of people and their absoption into mass media is its own prophetic message that's gone, to a great degree, unheard by a public happy to be sucked into cynical, money-making corporate versions of the truth and virtually real social "networks." The signature line from Network is Beale's "I'm mad as hell, and I'm not going to take it anymore! "—a rallying cry echoed, but not necessarily understood, by the Americans shouting it from their windows. Such ironies are some of the "primal doubts" Chayevsky sees at the heart of our postmodern world, in which the primary medium of television is, more often than not, virulent, banal and destructive and in which no value goes uncorrupted by "the American Dream" of wealth (in what may be the film's most hilarious moment, a communist demands a bigger piece of the contractual pie and a terrorist negotiates subsidiary rights). The great Lumet directs with his customary sensitivity to detail and pacing, as well as an insider's knowledge of how networks (and, for that matter, humans) think. Working with top cinematographer Owen Roizman (The Exorcist), the great Lumet directs with customary sensitivity to detail and pacing, as well as an insider's knowledge of how networks (and, for that matter, humans) think. He also gets terrific performances across the board: Finch and Dunaway collected top acting honors at the Oscars, and in their nominated turns, Holden and Ned Beatty (as a creepily immoral corporate chairman) do some of their best work. Historically expected to run at a deficit, television news now effectively operates on the profit imperative Chayevsky diagnosed—in the corporate transition overseen in the film by UBS' executive senior v.p. Frank Hackett (a sharp Robert Duvall), a wolf in executive's clothing. But Chayevsky's wave of the future is best embodied by Christensen, the blunt and possibly soulless executive who, sensing what the public wants, demands "angry shows," like the terrorist-starring reality show "The Mao Tes-Tung Hour." Schumacher falls for the much younger, live-wire Diana, even as he recognizes their relationship is misbegotten and doomed. Confessing to his wife (Beatrice Straight, who also won an Oscar for her single scene), Max offers, "I'm not sure she's capable of any real feelings. She's television generation. She learned life from Bugs Bunny. The only reality she knows comes to her over the TV set." Given that today's audiences resemble that remark, Network has lost none of its sting. 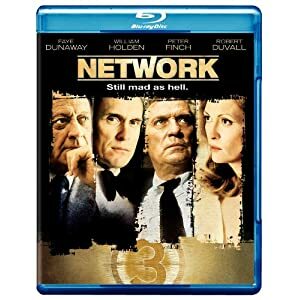 Network roars back onto TV screens in its Blu-ray debut. The hi-def transfer is excellent, capturing the film's original theatrical look without resorting to digital manipulation. Grain is natural, black level deep, and texture impressive, with detail better than ever on home video. As per its 1970s origins, the film has a softer look that today's pinpoint digital images, but in resolution and color, this transfer is gloriously true to the source. One can't expect too much—except for faithfulness—from the DTS-HD Master Audio mono mix, but it delivers the original audio in a clean and clear track. The bonus features here, returning from the two-disc DVD special edition, are outstanding. First off, there's a commentary by director Sidney Lumet. One of Hollywood's greats, Lumet is always fine, thoughtful and informative company, despite a few gaps in the track. Feature-length doc The Making of 'Network' (1:25:28, SD) covers the project's origins and casting, writer Paddy Chayevsky, production, and a perspective on the film's content by way of interviews with producer Howard Gottfried, editor Alan Heim, Lumet, Lance Henriksen, Faye Dunaway, Ned Beatty, Kathy Cronkite, production designer Philip Rosenberg, director of photography Owen Roizman, and newscaster/reporter Walter Cronkite. “3/2/1977 Dinah! with Paddy Chayevsky” (14:02, SD) is a fascinating bit of promotion saved from the ether: Chayevsky's blistering intelligence is in fine form, and Dinah can hardly get a word in edgewise. “Private Screenings with Sidney Lumet” (54:34, SD) is an installment of Robert Osborne's always fascinating sit-down interview series, with the host this time swiftly taking Lumet through his long resume. Last up is the film's “Theatrical Trailer” (2:59, SD). It's great to see this film get the deluxe treatment it deserves, including hi-def A/V specs. All site content © 2000-2019 Peter Canavese. Page generated at 04/21/2019 12:02:02AM.